A leaner Hakka Kau Yoke (Steamed Pork with Taro) using tender sirloin roast instead of pork belly. Much faster to cook and just as tasty. The Hakka people have several pork dishes that are absolutely delicious and this Hakka Kau Yoke (Steamed Pork with Taro) is one of them. The combination of tender pork, fluffy taro (a.k.a. yam in Malaysia), and distinctive fermented red bean curd is truly delicious. They all blend together to make an amazingly rich and tasty dish. 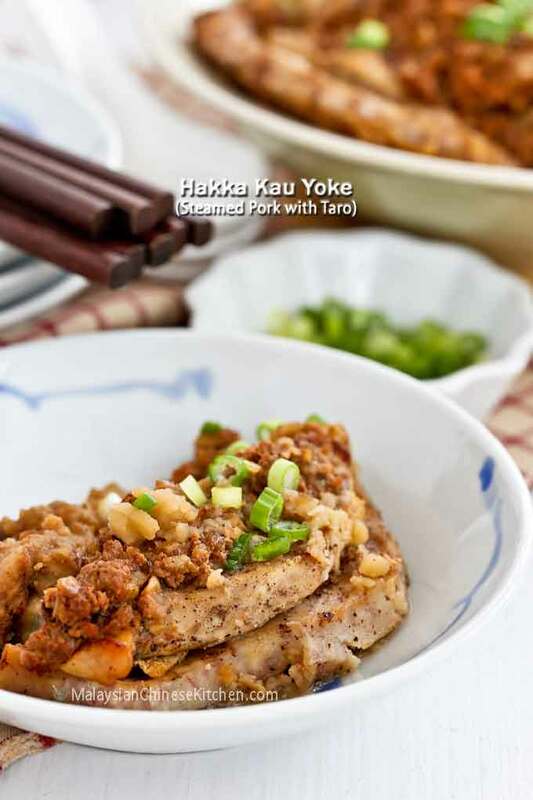 Hakka Kau Yoke is usually made with pork belly. The rich fatty meat is steamed for several hours until it is super tender. While it is very yummy and great for festivals, it can also be a little too rich for every day consumption. As such, I prefer to use a leaner and more tender cut of meat like sirloin roast. Here in the US, sirloin roast usually comes in a nice long slab. This is perfect because it can be cut into quarter inch thick slices to be layered with the taro. Hence, the preparation is slightly different than when pork belly is used. Instead of blanching and frying the pork belly before slicing, I simply slice and pan fry the sirloin roast. This method also takes a shorter amount of time and the dish can be prepared in just over an hour as compared to 2 to 3 hours. 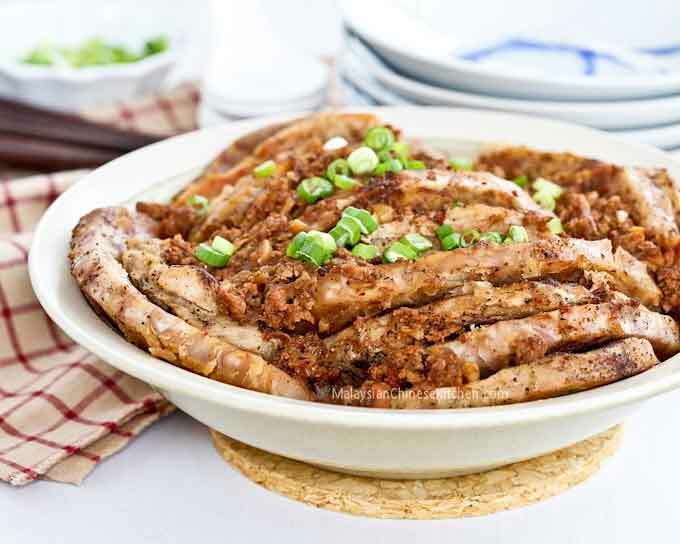 A lower fat Hakka Kau Yoke (Steamed Pork with Taro) using tender sirloin roast instead of pork belly. Much faster to cook and just as tasty. Sprinkle half of the salt, ground pepper, and five-spice powder evenly over both sides of taro slices. Do the same for the pork. Heat 2 tablespoons vegetable oil in a non-stick pan. Pan fry taro slices for about 3 to 4 minutes on each side. Do the same with the pork slices. Arrange the alternating pan fried taro and pork slices in a shallow bowl. Set aside. Prepare a steamer. Heat remaining 2 tablespoons vegetable oil in a small saucepan. Sauté garlic and onion for 1 to 2 minutes. Add nam yee (fermented red bean curd). Mash the nam yee with your spatula. 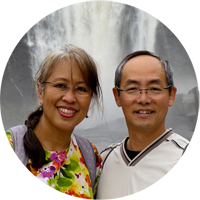 Pour in the water and continue to mash the nam yee until it dissolves. Add sweet soy sauce. Allow the sauce to boil for 1 to 2 more minutes. Turn off the stove. Pour the sauce over the arranged taro and pork slices. Cover the bowl with aluminum foil. Transfer bowl to the prepared steamer. Steam for 45 minutes. Carefully remove the aluminum foil from the bowl. Steam for another 5 minutes. Turn off the stove. 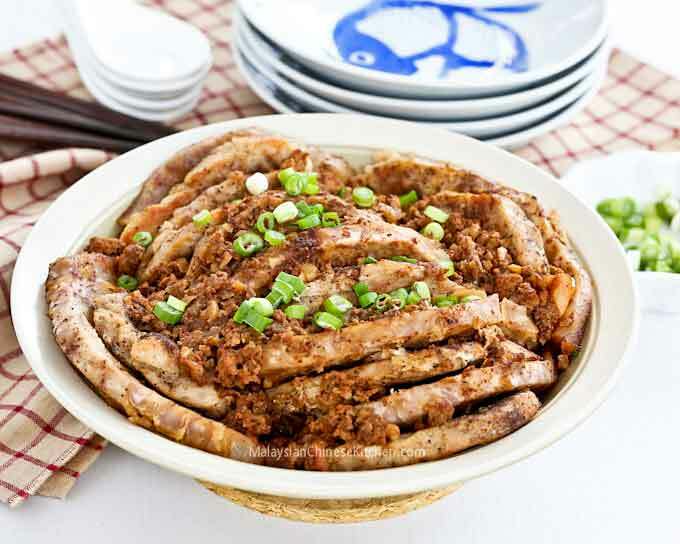 Remove steamed pork with taro from the steamer. Garnish with thinly sliced green onions. 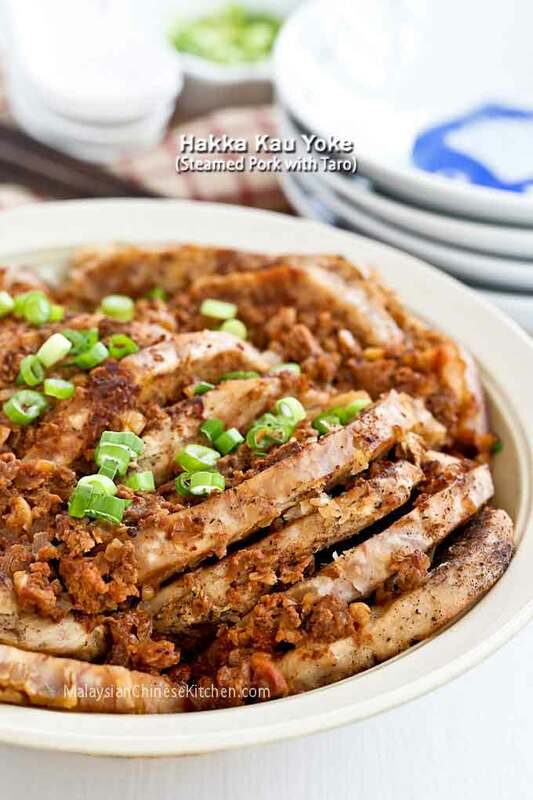 This flavorful Hakka Kau Yoke is best served with plain steamed rice and a veggie stir fry like the ones listed below. Do give it a try. If you would like to have a soup to go with your meal, may I suggest the following. can we skip the nam yee? or can we substitute it with something else? The taste will be quite different without nam yee. You can definitely experiment with different sauces.